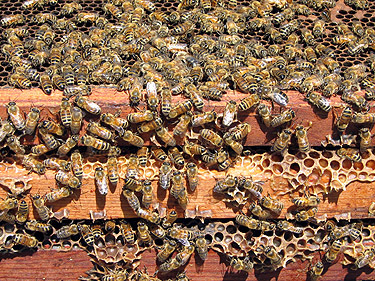 We don’t harvest the honey until at least three-fourths of the super (section of a hive used for honey storage) is sealed with wax. This is to ensure we are not taking “green honey” (that is, honey before the bees have fanned the moisture content of the nectar to 17-18%). We also monitor the moisture content of the honey by using a handy device called a refractometer. 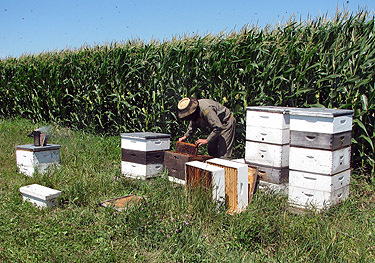 After sampling the honey in the bee yards for moisture, a decision is made to start removing the honey from the hives. We use smoke, and at times bee escapes, where the bees are trapped out of the super we want to remove. 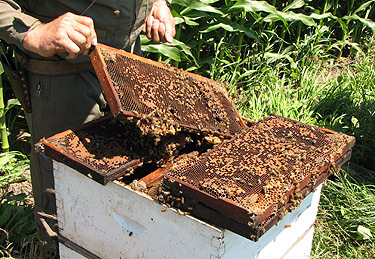 We also use a bee blower to remove excess bees from the honey combs. The honey is then hauled to the honey house, where we place the filled supers into the “hot room.” The temperature in this room is held at 80 degrees F. This allows the bees to escape and slowly warms the honey for extracting. We have a machine that removes the cappings from the combs. 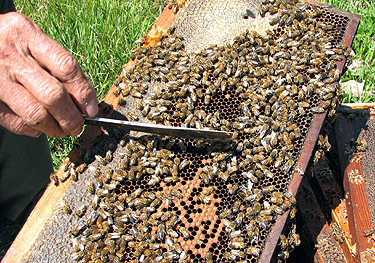 The combs are also inspected to assure all caps are removed, and then they are placed into a centrifugal extractor. The honey is spun out and drains into a pumping tank. Then it is pumped into a large holding tank. After a period of time, the honey is pumped from the bottom of the tank and strained through a nylon cloth to catch remaining wax particles. Again, we allow the honey to settle out. This is time-consuming, but we feel it is necessary to maintain the delicate flavor necessary to meet our high standard for a quality, delicate flavor. 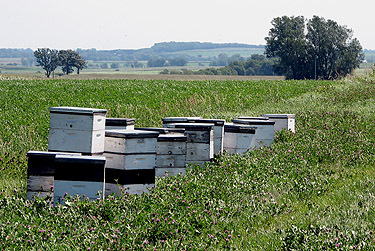 As you can tell, we don’t use chemicals to remove the bees, and we don’t force-filter our honey. Later in the year when we heat our honey for bottling, a hot water bath is used. This guarantees the honey is heated slowly and thoroughly. We know you have many choices when it comes to honey. We hope this explanation will encourage you to consider Gentle Breeze Honey® the next time you purchase!